At the Magical stage of development humans are not really interested in clothes per se. Naked in nature our early ancestors lived, and continue to live in remote parts of the Amazon, in a Eden like garden of abundance and relative security. Developing strategies to survive and live well in the world the earliest humans relied not on logic or reason to get on, instead they developed instinct and skill. 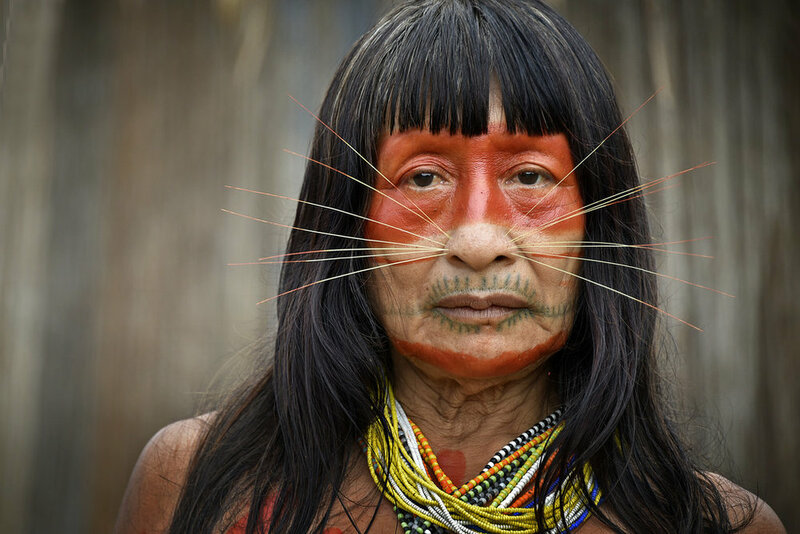 The Mayoruna man in the picture is decorated with whisker like a jaguar in order to attain some of the beasts courage and power for his hunting expedition. To us moderns, our magical ancestors might seem simplistic in their beliefs and views. Magical symbols and decorations are an important part of the culture. Due to the geographical locations of these ‘lost’ tribes clothes are an optional extra rather than a climatic imperative. A Mayoruna man dressed for a hunt. Magical fashion is not fashion as we know it however the magical elements of clothing persist even today as we have not forgotten our past, only transcended and included it. Where does the magical appear in todays fashion? Logos are our magical symbols but instead of conferring success in the hunt, modern branding implies other, more subtle attributes will be associated with the wearer. Beauty and power is implied and achieved by certain brands, thats the appeal of them.